We've arrived at December 20th and all of a sudden it seems like time is standing still and we are creeping towards Christmas. Can it move any slower? I finally have finished my holiday shopping and am dying for the work week to be over so I can board Metro North and head back to Connecticut. I'm looking forward to sleeping in, doing a lot of reading (for fun! ), watching movies, and lounging around. This weekend will probably be the only time that my family is together for the next several months. The holidays are one of my favorite times of the year, but also make me feel kind of depressed because they are followed by January and February, which are my two least favorite months of the year. They are so dreary! This year I am focused on staying positive though. I am not normally one for resolutions but I want to think of some goals for 2018 that are attainable and will have a positive impact in my life. I'm hoping that over the next week or so I can decide what those will be and can't wait to share them on the blog! In a medium bowl, sift together the flour, cornstarch, Earl Grey ground tea leaves and salt. Set aside. In a large bowl, cream the butter on medium speed until smooth. Add the sugar and continue to mix until smooth. Add the brewed Earl Grey tea and combine. In portions, gradually add the flour mixture and mix until just incorporated. Divide the dough in half and wrap in plastic wrap in two separate portions. Refrigerate until firm (preferably overnight). When firm, remove the dough from the refrigerator and let it sit at room temperature for 15-20 minutes. Remove from the plastic wrap and place on a lightly floured surface. Roll it out in a circle/oval until it is 1/4 inch think, rotating the dough often and flouring as needed to make sure it doesn’t stick to your surface. If the dough cracks immediately when you start to roll it, it's too cold so you need to let it sit longer. If it sticks with flour, it's too warm and needs to be put back into the fridge. Cut to desired shape. I used a circle with a fluted edge. Transfer to a parchment-lined sheet pan and put into the freezer and freeze until solid. This will ensure that the shortbread is nice and flaky. 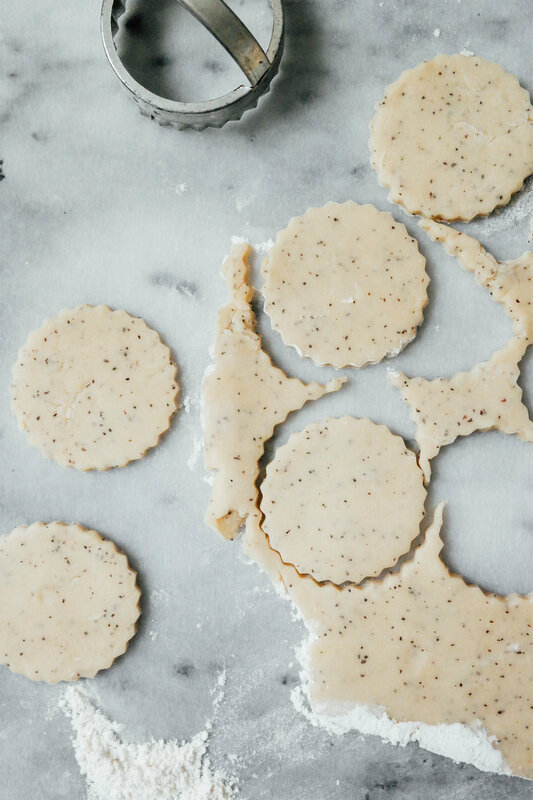 Bring the dough scraps together into a ball and chill briefly before re-rolling and cutting more cookies. Continue as dough remains. Preheat your oven to 350°F. Place the cookies at least 1 inch apart on a parchment-lined sheet pan. Bake for 12 minutes. They won't really brown on top so once they seem solid, and slightly browned on the bottom, they are done. Remove from the oven and let cool. Prepare the glaze by combining confectioner's sugar with lemon juice. The consistency should be spreadable and thick, but not runny. Once the cookies are cool, add about a 1/2 teaspoon of glaze to the top and spread evenly with the back of a metal spoon. Add a couple rose petals (or other desired decoration) on top for decoration.